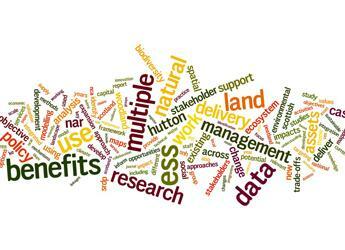 This Work package is focussed on how managing natural assets can achieve sustainable land use which is resilient to future pressures and contribute to sustainable growth of the Scottish economy, our health and well-being.Building on research on soils, water and biodiversity, we are analysing the trade-offs and synergies inherent in delivering multiple benefits and exploring sustainable trajectories. The research is designed to support policy development and reviews, through for example, providing evidence any revision of agri-environmental payments and to inform land managers’ practices. Our vision for 2021 is to provide the scientific capacity and knowledge brokerage to support Scottish Government (SG) and its agencies to achieve their outcomes, and through these, the UN Sustainable Development Goals. We like to engage key stakeholders from a wide range of backgrounds, including Scottish Government, agencies such as SNH and SEPA, environmental NGOs and land-based industries, in developing, implementing and using our research. We also support the Ecosystems and Land Use Policy Engagement Group with the Biodiversity work package and the Soils Engagement Group in conjunction with the Soils work package. Outputs specific to each research deliverable will be found on their pages.